I'm not too crazy about lime-yellow-chartreuse greens, although, like the spiffy new VW Beetle, they have their place in a lighthearted sort of way. Some folks find yellow-green upbeat and energizing; others, like me, find it edgy and jumpy. I'm not big on pastel greens either, Martha Stewart notwithstanding. I still associate those watery shades with hospitals and college dorms, although I'm aware that, for many, they evoke fresh air, nostalgia and Good Things. Is this too personal? Nope, color is personal. No color is good or bad in itself; our reactions to it are emotional or situational. The very tones I dislike in home decor, I love in nature – especially the soft yellow-green haze of trees budding in spring. In such ways, nature sets the precedent for decorating with greens, making them amazingly easy to mix together – outdoors or in. In the same vein, my preferred green for home and fashion is deep and rich, like the evergreen backdrop that's a perfect foil for autumn's golds and reds. Some call it forest or hunter green; others – thinking, no doubt, of classic sports cars – call it racing green. It is the leather on certain Chesterfield sofas, Mission chairs, gold-stamped books and the lampshades of certain antique French lamps. My green melds drama with dignity. It mellows the intensity of red, purple or dark blue while adding richness to the mix. It's striking with black or in a stripe with yellow, white and a pencil-thin line of red. It's a wonderful background color, from Medieval tapestries to 1930s and '40s Retro fabrics and wallpaper. And, of course, it's a natural for floral prints of any era. My green makes a marvelous mat for framed art and, combined with rich woods, a superb wall color for a home office or library. I admire another family of greens equally. Softened by brown or gray to near-neutral status, they are somewhat less dramatic but with great character. 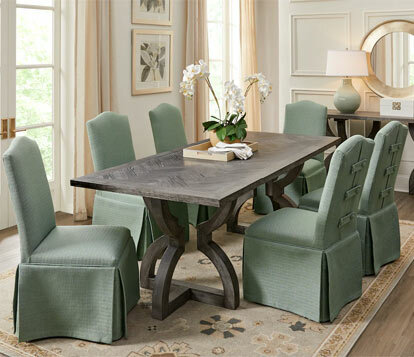 There are actually two groups of cousins in this family: warm, slightly murky tones with a taupe or olive cast and cooler, more subtle hues like khaki, sage and celadon. Both sets of cousins allow you to expand the possibilities of fail-safe neutrals like beige, white, gray and even black. But they also combine remarkably well with stronger colors. Celadon and red are an arresting combination, as are sage and purple or olive and blue. There is certainly a place in this world for the preppy, perky greens you see on golf courses, frequently paired with pink or yellow. If these are your favorites, bless you for your sunny disposition – but I prefer a little more mood and complexity. Give me the rich, nearly black green of dressy velvets or the sophisticated serenity of moss or lichen linen. But let's keep it simple: for endless color options, just give me green.